Ringraziamenti/Acknowledgements : Rémy Jannin, Sylvain Cadars, Pierre Alexandre Tremblay, Daniele Ghisi, Andrea Agostini, Raffaele Grimaldi, Andrea Sarto, Gabriele Bonomo, Laura. Eric Maestri, born in 1980, has a trajectory toward composition that is equal parts expected and unexpected. The former includes formal education in Brescia and Turin, then Strasbourg, with additional training in Paris. The latter includes a detour into philosophy in Turin and a span of six years, in his 20s, when he was not active at all in composition. One already gets the sense from these basic facts that he is a composer critical of every move and a man with much more to offer than a mere experience in sound. I have no intention to suggest that he is someone for whom extra-musical ideas take precedence; rather, his experience in realms far beyond music have left an indelible mark on the sensations that he decides to turn into music. By way of introducing the present CD of his music, my text interleaves my commentary with extracts from an extended, and virtual, conversation with the composer. When I asked Eric about music and philosophy, the nexus between the two and whether or not music had ever been his intended career, he responded, And still it is not. I don’t think of music as a career, but rather as a very individual path, a solitary one, incomprehensible to others. From 21 to 27 he was musically tacit, attracted to strong personalities in music yet unsure of his own way forward; he retreated into the work of the deconstructionists. Philosophy instilled him the virtue of patience, one increasingly on the decline in our hyperactive world. His music, which he insists needs to represent itself and to be free from the need to justify its existence, takes its time, needs its own space, demands attention. Time, and the awareness of time, is of the utmost importance in understanding his music. Deconstructionism and semantics, in particular, have left profound marks on his way of thinking about music, with a passion for getting to the most fundamental aspect of sound and a belief in the power of signs and symbols guiding his aesthetics. Rather than preconceiving music, Eric follows an intuitive path in his approach in which he tries to bring experience and writing into closer proximity: what he calls the compositional moment. He thereby uses the process of committing notes to paper itself as a source of energy and suggestion. In the constant struggle between the predictable and the unpredictable, he errs toward the latter. Though he left behind philosophy as a trajectory, going forward he knew that his music would never be able to leave behind it. In the composer’s words, his music is the collision of thought and experience; to write is to imagine musicians on stage. At the heart of his music lies a preoccupation with the physical experience of producing sounds and the equally-physical experience of listening to sounds. In his commitment to examining music at its physical roots, he has many peers among his contemporaries; he aims never toward outwardly-complex ends, instead preferring the only complex part of his music to be its meaning, a subjective interpretation bound to change with each new experience. Accompanying this wish for a complexity in meaning is an aversion to lecturing his audiences: His music must exist without reference to philosophical considerations. It is an experiential art, meant to be felt, not merely read about. Eric was a late starter in musical terms, not beginning serious study of the piano until he was 13. Attempts at composing started within a few years. The composer likes to note that music, and questions about it, are inextricably tied to larger questions about existence itself: I am quite gifted in speculation! The thing itself and the analysis of it, the circumspection of it, are inseparable. The child who played the same melody again and again, listening for differences in contours and values, grew into the composer unafraid of lingering within confined spaces of sound and unapologetic for being thorough, even systematic. When, late in Le Cose, the violin repeats a low B-natural or a high F-sharp several times, the sound is never quite the same despite identical markings; this moment, in particular, seems paradigmatic of his approach to music, a microscopic inspection of sound in the context of what preceded and what will follow. Gilberto Bosco in Turin and Ivan Fedele in Strasbourg rank as his most important teachers. The former inculcated an attention to detail from which Eric continues to learn. The latter helped him with critical, practical and artistic insight at a time when he was unsure how to carry on. Beyond his primary teachers, Eric remembers the words of Yan Maresz with fondness. 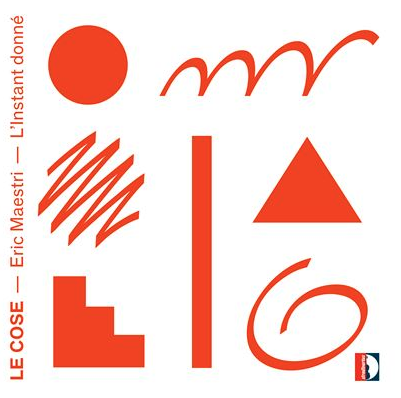 Indeed, Maresz’s comment about Eric’s music, i. e. that it seems to be composed as if observed from afar, could almost serve as an aesthetic statement. 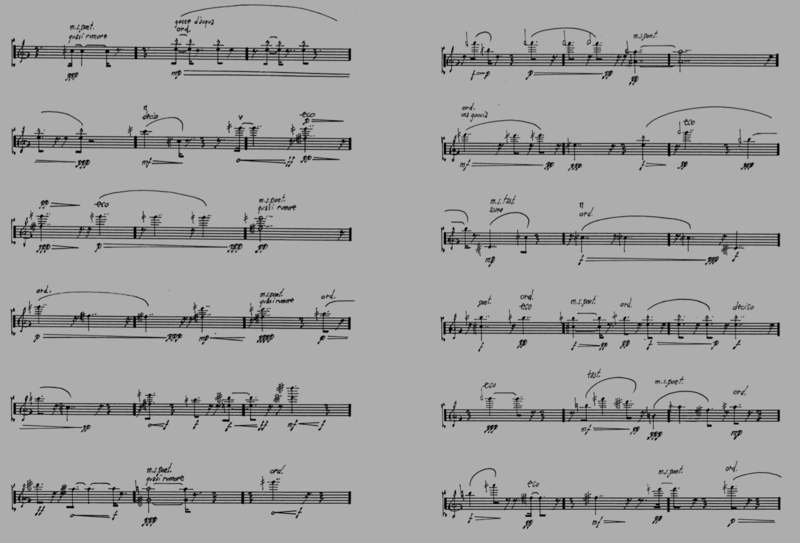 The pieces in question, arranged into a continuous sequence of approximately an hour, date from 2010–15 and have the foci of music for piano and/or music for strings, with Tre Case adding a clarinetist to the texture. These works are individual points at which the cosmic stream that engulfs all of us stops, or in the composer’ words, representations of individual and cosmic movements, ‘pieces of the infinite’, extracted from a larger movement. Writing becomes a kind of concrete means of abstraction of the temporal stream: it allows me to observe time as I fix it in a geometrical, written dimension. The six pieces on this CD Le Cose could thus be seen as a tree with six branches: music as continuum. The choice of instrumentation is immediately conspicuous, perhaps even conservative. Electronics are absent; brass are absent; and, most of all, percussion is absent. He has of course used all of the above in other pieces, with different aims, but as the six pieces on this CD demonstrate, one need not have a broad range of colours at hand in order to make music of the utmost variety and subtlety. If his music is sober, it is never without expressive ends. Each piece here tackles repetition and variation, to greater or lesser degrees, in the sense that each one is a working-out of material and gestures revealed early on. The cycle begins and ends with music for solo piano. The score of Autoritratto II (Self-Portrait II) (2012), the shortest work here, has only two pages. Despite opening with a high B in ffff, the prevailing characteristic of the piece is repose; nonetheless, the tempo is far from stately, at quarter-note = “80 ca.”. It is also remarkable in its sparseness, as the pianist plays almost exclusively isolated notes, with only a few two- and three-note chords; indeed, the left hand only ever plays single notes! Autoritratto I (Self-Portrait I) (2012) is for the classical “piano quartet” of piano, violin, viola, and cello. Perhaps not by coincidence, this ensemble is also the instrumentation of the last completed work by Morton Feldman, simply called Piano, Violin, Viola, Cello (1987). It, too, is extreme in its transparency, almost threadbare, at least to start. A cross-section of the markings in the score help to illuminate the composer’s ideal of sound here: fragoroso, liquido, luminoso, quasi rumore, velato, etc. The music gathers momentum, and the texture thickens, only to thin out again. The strings play the protagonists here, often ricocheting around and alongside each other, with the piano as a detached, restrained observer. By the end, the proceedings are so infrequent that the rare moments of action almost seem to disturb the quietude. Violin and piano end on a soft unisono E-flat. Another solo is the longest individual movement on the CD. It is Le Cose (Things) (2012) for violin, lasting almost 20′ and moving at a deliberate, almost morendo, pace. The violin obviously has a lineage of bravura solo pieces, dating back centuries, but it also has a more recent tradition oriented more toward an introspective view of the instrument and its sound-making possibilities. Le Cose is definitely in the latter category. The materiality of the piece is present in its title, sure, but in its palpable descent into, and back out of, microtonality, too. The introduction of a tuning fork, applied to and removed from the body of the instrument in alternation, late in the piece is less deus ex machina than natural consequence, as it is unable to win a restoration to the artificial world of Western tuning. The string trio Ancora ancora la notte (The Night Again Again) (2015) is the most recent work here and thereby also the closest approximation to the composer’s current preoccupations. It is a sequel of a sort to Ancora la notte (The Night Again) (2014–15), a much shorter piece also for string trio. The sustained and the restless converge, with neither stasis nor propulsion the main point of the piece. Unisons act as isles of repose, soon to be dissolved. The texture is in three parts and the form is one of continuous expansion, as the night transforms itself into morning, death into life. A violent surprise lingers near the end. Notions of the celestial and the nocturnal recur in Eric’s work. The form of a piece need not always be logical, sequential; the real need not always be concrete, the abstract not always a mere idea. The boundary between dream and wakefulness, the possible and the impossible, must grow smaller every day. Tre Case (2012–13), for the quintet of clarinet + bass clarinet, piano, violin, viola, and cello, splits itself not into three parts, but rather four: Gli angoli delle case (The Corners of the House), Dettagli (Details), Case nascoste (Hidden Houses), and Le case (Houses). Dettagli is the most active part, with strings bustling and bouncing, and with interplay among clarinet and piano. The other sections flit between the tender and the brash, the introspective and the forward, with clear demarcations between the instrument families. A chain of ten unisons near the end, for strings alone, reinforces the divide between strings and the other pair of instruments. The series rounds off as it started, for a solitary piano. Natura degli affetti (2010) begins with long strands of mostly descending notes in the following pattern: figure, fermata with resonance, figure, fermata with resonance. The gaps are not silences. Instead the resonances of the previous gestures are meant to be sustained for irregular periods of time, making the gulf between anticipation and response unpredictable. The course of the piece evolves, with chords later taking over the resonance. Indeed, the piece closes with gentle pp chords, intimations of the infinite left unresolved.